“This is the Messiah.” Still others were saying, “The Messiah doesn’t come from the Galil, does He? 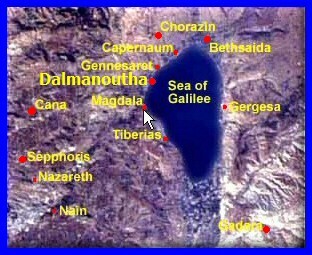 The Yam Galil, also Kinneret, Lake of Gennesaret, or Lake Tiberias (Hebrew: יָם כִּנֶּרֶת, Judeo-Aramaic: יַמּא דטבריא; גִּנֵּיסַר Arabic: بحيرة طبريا‎‎), is a large freshwater lake in Yisrael. 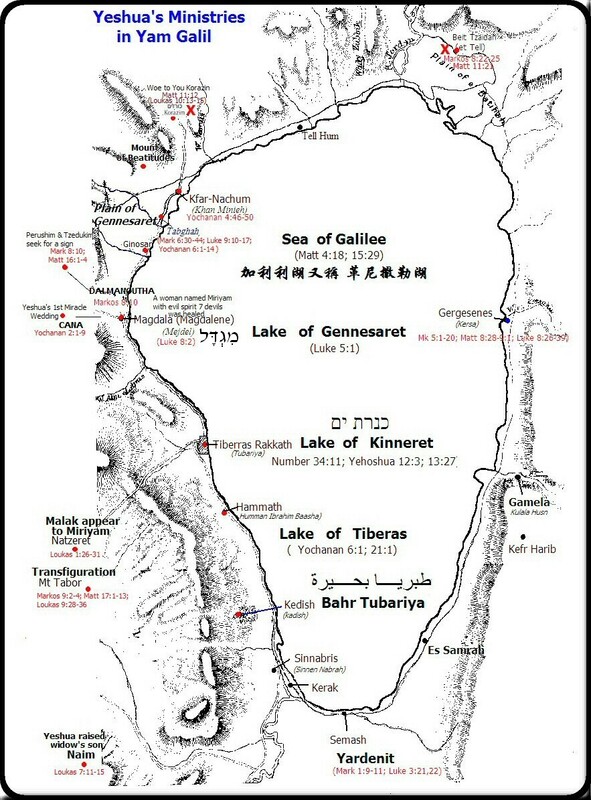 Lake Kinneret (Hebrew ים כנרת) (Bamidbar 34:11; Yehoshua 12:3; 13:27)加利利湖又稱「革尼撒勒湖」 is also called the Yam Galil or Sea of Galilee (MattitYahu 4:18; 15:29), also Sea of Genneseret, Lake Kinneret or Lake Tiberius (Yochanan 6:1; 21:1), the name used by the natives at this time-Bahr Tarbariyeh (بحيرة طبريا) , is Yisrael's largest freshwater lake this name originate from the Hebrew word kinnor ("harp" or "lyre") in view of the shape of the lake. 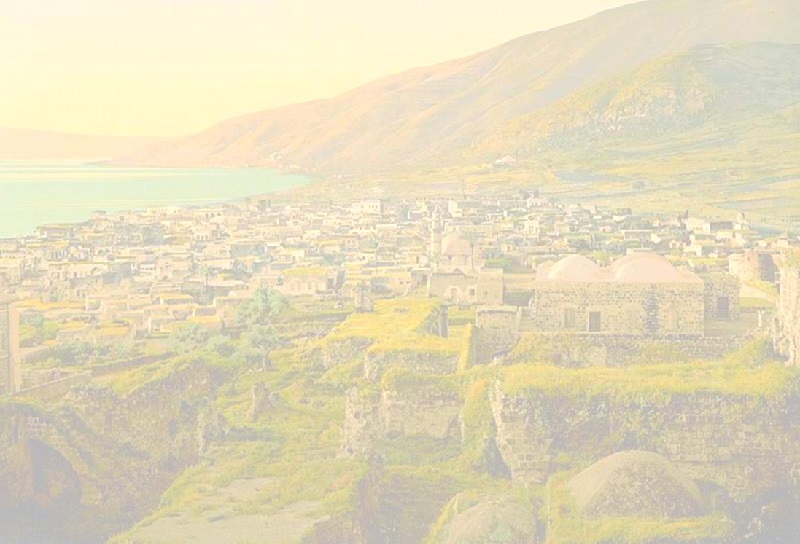 The Kinneret is situated deep in the Yarden Great Rift Valley, the valley caused by the separation of the African and Arabian Plates and is fed partly by underground springs although its main source is the Yarden River which flows through it from north to south. Consequently the area is subject to earthquakes and, in the past, volcanic activity. This is evidenced by the abundant basalt and other igneous rocks that define the geology of the Galil region. Due to its low-lying position in the rift valley, surrounded by hills, the sea is prone to sudden violent storms; hence the Brit Hadashah account of Yeshua calming the storm. Indeed, the main feature of the lake seems to be its ever-changing character. It is still noted, for its rich fish stocks. The Zohar, the foundational work of Jewish mysticism, cites the Galil as the place in which the beginnings of the Messiah can first be seen. The Mashiach... will arise in the land of Galil... the Mashiach shall reveal Himself in the land of Galil because in this part of the Set Apart land the desolation (Babylonian exile) first began, therefore He will manifest Himself there First." Yehoshua 19:32 The sixth lot came out for the descendants of Naftali, for the descendants of Naftali according to their families. 1) a territory in Naftali largely occupied by goyim; a circuit of towns around Kedesh-Naftali, in which were situated the 20 towns given by Shlomo to Hiram king of Tyre as payment for his work in conveying timber from Lebanon to Yerushalayim. (Yehoshua 20:7)So they set apart Kedesh in the Galil, in the hills of Naftali; Sh'khem in the hills of Efrayim; and Kiryat-Arba (that is, Hevron) in the hills of Y'hudah. (Yehoshua 21:32)Out of the tribe of Naftali: Kedesh in the Galil with its surrounding open land, the city of refuge for the killer; Hammot-Dor with its surrounding open land; and Kartan with its surrounding open land — three cities. (1 Melekhim 9:11)King Shlomo gave Hiram twenty cities in the land of the Galil (recall that Hiram the king of Tzor had supplied Shlomo with cedar and cypress logs and with all the gold Shlomo wanted). (2nd Melekhim 15:29)During the time of Pekach king of Yisra'el, Tiglat-Pil'eser king of Ashur came and conquered `Iyon, Avel-Beit-Ma`akhah, Yanoach, Kedesh, Hatzor, Gil`ad, and the Galil — all the land of Naftali — and took them captive to Ashur. (1Chronicle 6:76)(6:61) and from the tribe of Naftali: Kedesh in the Galil with the surrounding open land, Hamon with the surrounding open land and Kiryatayim with the surrounding open land. (Yeshayahu 9:1)(8:23) But there will be no more gloom for those who are now in anguish. In the past the land of Z'vulun and the land of Naftali were regarded lightly; but in the future he will honor the way to the lake, beyond the Yarden, Galil-of-the-Goyim. (Matityahu 3:13) Then Yeshua came from the Galil to the Yarden to be immersed by Yochanan. (Matityahu 4:23) Yeshua went all over the Galil teaching in their synagogues, proclaiming the Good News of the Kingdom, and healing people from every kind of disease and sickness. (Mat 4:25) Huge crowds followed him from the Galil, the Ten Towns, Yerushalayim, Y'hudah, and `Ever-HaYarden. (Mat 19:1) When Yeshua had finished talking about these things, he left the Galil and traveled down the east side of the Yarden River until he passed the border of Y'hudah. (Mat 21:11) And the crowds answered, "This is Yeshua, the prophet from Natzeret in the Galil." (Mat 26:32) But after I have been raised, I will go ahead of you into the Galil." (Mat 26:69) Kefa was sitting outside in the courtyard when a servant girl came up to him. "You too were with Yeshua from the Galil," she said. (Mat 27:55) There were many women there, looking on from a distance; they had followed Yeshua from the Galil, helping him. (Mat 28:7) Then go quickly and tell the talmidim, 'He has been raised from the dead, and now he is going to the Galil ahead of you. You will see him there.' Now I have told you." (Mat 28:10) Then Yeshua said to them, "Don't be afraid! Go and tell my brothers to go to the Galil, and they will see me there." (Mat 28:16) So the eleven talmidim went to the hill in the Galil where Yeshua had told them to go. (Markos 1:9) Shortly thereafter, Yeshua came from Natzeret in the Galil and was immersed in the Yarden by Yochanan. (Markos 1:28) And the news about him spread quickly through the whole region of the Galil. (Markos 1:39) So he traveled all through the Galil, preaching in their synagogues and expelling demons. (Markos 3:7) Yeshua went off with his talmidim to the lake, and great numbers followed him from the Galil. (Markos 6:21) Finally, the opportunity came. Herod gave a banquet on his birthday for his nobles and officers and the leading men of the Galil. (Markos 14:28) But after I have been raised, I will go ahead of you into the Galil." (Markos 14:70) Again he denied it. A little later, the bystanders themselves said to Kefa, "You must be one of them, because you're from the Galil." (Markos 15:41) These women had followed him and helped him when he was in the Galil. And many other women were there who had come up with him to Yerushalayim. (Markos 16:7) But go and tell his talmidim, especially Kefa, that he is going to the Galil ahead of you. You will see him there, just as he told you." (Loukas2:39) When Yosef and Miryam had finished doing everything required by the Torah of Adonai, they returned to the Galil, to their town Natzeret. (Loukas4:14) Yeshua returned to the Galil in the power of the Spirit, and reports about him spread throughout the countryside. (Loukas4:31) He went down to K'far-Nachum, a town in the Galil, and made a practice of teaching them on Shabbat. (Loukas5:17) One day when Yeshua was teaching, there were P'rushim and Torah-teachers present who had come from various villages in the Galil and Y'hudah, also from Yerushalayim; and the power of Adonai was with him to heal the sick. 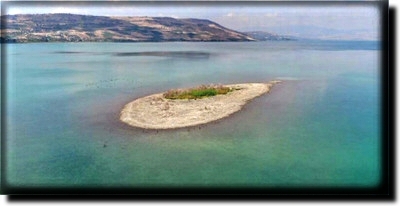 (Loukas8:26) They sailed on and landed in the region of the Gerasenes, which is opposite the Galil. (Loukas13:1) Just then, some people came to tell Yeshua about the men from the Galil whom Pilate had slaughtered even while they were slaughtering animals for sacrifice. (Loukas13:2) His answer to them was, "Do you think that just because they died so horribly, these folks from the Galil were worse sinners than all the others from the Galil? (Loukas17:11) On his way to Yerushalayim, Yeshua passed along the border country between Shomron and the Galil. (Loukas22:59) About an hour later, another man asserted emphatically, "There can be no doubt that this fellow was with him, because he too is from the Galil!" (Loukas23:5) But they persisted. "He is inciting the people with his teaching throughout all Y'hudah — he started in the Galil, and now he's here!" (Loukas23:49) All his friends, including the women who had accompanied him from the Galil, had been standing at a distance; they saw it all. (Loukas23:55) The women who had come with Yeshua from the Galil followed; they saw the tomb and how his body was placed in it. (Yochanan 1:43) The next day, having decided to leave for the Galil, Yeshua found Philip and said, "Follow me!" (Yochanan 2:1) On Tuesday [Greek: the third day, equivalent to Hebrew yom shlishi] there was a wedding at Kanah in the Galil; and the mother of Yeshua was there. (Yochanan 2:11) This, the first of Yeshua's miraculous signs, he did at Kanah in the Galil; he manifested his glory, and his talmidim came to trust in him. (Yochanan 4:3) Yeshua left Y'hudah and set out again for the Galil. (Yochanan 4:43) After the two days, he went on from there toward the Galil. (Yochanan 4:45) But when he arrived in the Galil, the people there welcomed him, because they had seen all he had done at the festival in Yerushalayim; since they had been there too. (Yochanan 4:46) He went again to Kanah in the Galil, where he had turned the water into wine. An officer in the royal service was there; his son was ill in K'far-Nachum. (Yochanan 4:47) This man, on hearing that Yeshua had come from Y'hudah to the Galil, went and asked him to come down and heal his son, for he was at the point of death. (Yochanan 4:54) This was a second sign that Yeshua did; he did it after he had come from Y'hudah into the Galil. (Yochanan 7:1) After this, Yeshua traveled around in the Galil, intentionally avoiding Y'hudah because the Judeans were out to kill him. (Yochanan 7:9) Having said this, he stayed on in the Galil. (Yochanan 7:41) others said, "This is the Messiah." But others said, "How can the Messiah come from the Galil? (Yochanan 7:52) They replied, "You aren't from the Galil too, are you? Study the Tanakh, and see for yourself that no prophet comes from the Galil!" (Yochanan 12:21) They approached Philip, the one from Beit-Tzaidah in the Galil, with a request. "Sir," they said, "we would like to see Yeshua." (Yochanan 21:2) Shim`on Kefa and T'oma (his name means "twin") were together with Natan'el from Kanah in the Galil, the sons of Zavdai, and two other talmidim. (Act 2:7) Totally amazed, they asked, "How is this possible? Aren't all these people who are speaking from the Galil? (Act 9:31) Then the Messianic community throughout Y'hudah, the Galil and Shomron enjoyed peace and was built up. They lived in the fear of the Lord, with the counsel of the Ruach HaKodesh; and their numbers kept multiplying. (Act 13:31) He appeared for many days to those who had come up with him from the Galil to Yerushalayim; and they are now his witnesses to the people.